You’ve probably heard Heather’s story before: Fare inspectors issuing a ticket when the Clipper Card reader wasn’t working. Heather attached a memo from the SFMTA (seen above) that says passengers can ride without paying when the Clipper Card reader is not working. After hearing so many of these stories, I think it’s probably worth walking to the front of the bus to try the Clipper Card reader there. Have you successfully contested a similar ticket before? I got onto a 1 bus at Embarcadero Center yesterday through the back door and the transponder stated “out of service.” Several others got on at the same time. When we got to Sacramento and Polk there were transit officers asking for proof of payment. They came to me and I gave them my Clipper Card with more than $20 on it. It showed no fare paid and I explained that the transponder was out of service when I got on the bus. The officer asked the driver who said the transponders were working the whole time. And in fact the back one had come back on. I asked the other passengers if they had gotten on the same stop and no one came forward. I was asked to get off the bus. A ticket was written to me for attempted Clipper failed to tag, which is $106.00. The officer said I could protest but I am concerned that I’ll still have to pay. I had money on my Clipper I was ready to pay my fare but could not. What more can a passenger do? I had to take that bus to get somewhere on time. I was late from having to get off the bus for the ticket, not to mention the humiliation of being seen as a fare evader. I’ve seen it written in Muni policy that if the transponder isn’t working you can just ride the bus without paying. I didn’t have the right amount of money for the fare. Can’t sympathize with Heather here. If the reader is not working, at least try the other reader. Otherwise, everyone will just claim that the reader wasn’t working. …yeah. OR, they could FIX THE GODDAMNED METERS! Crappy Muni equipment is not our fault – it is Muni’s. Just saying. Maybe if they want people to pay, they should make sure their equipment is working. If the reader worked as intended, this issue wouldn’t have occurred. The solution is for MUNI to adopt more reliable readers — this isn’t riders’ problem. If you do come across an “out of service” reader, make sure you get the driver to acknowledge you and the reader. If you get pulled off by an inspector, at least you can put the driver on the spot as well. 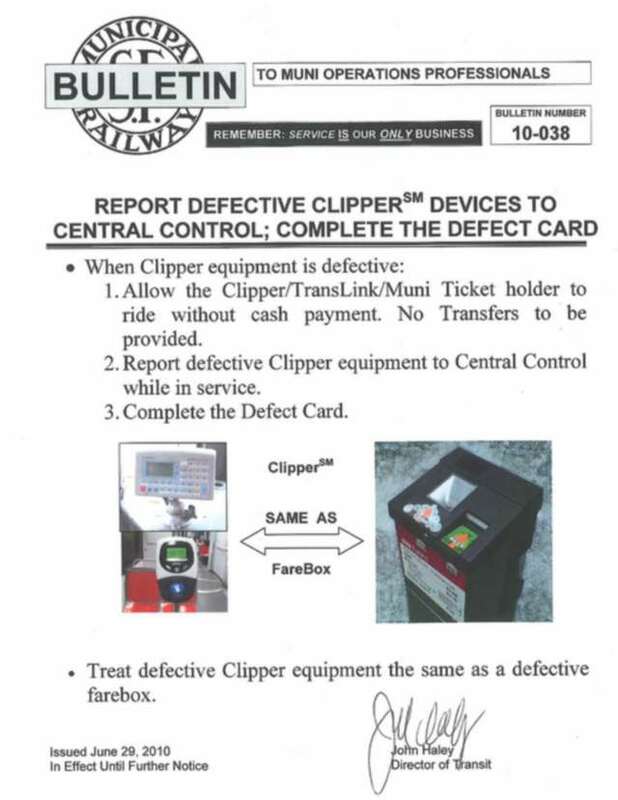 Also, report the bad reader to Clipper at: https://www.clippercard.com/ClipperCard/contactUs.jsf. Make sure you note the route and bus numbers. I’ve seen instances where both front and back readers would cycle in and out of being “out of service. This problem tends to happen more likely when the bus has just left the terminal and the bus was probably “turned off” while the driver was laying over at the terminal. However, I have also seen the readers cycle through while mid-route. The reliability of the readers have come a long ways since the dark days of Translink, but the readers do occasionally fail. In Heather’s case as she did not have a pass but rather money on her card, she should have been more diligent about checking the front and back readers. If she did not want to deal with the readers, she also has the option to buy a transfer from the driver. With that said, the 1 does get crowded during the afternoon rush, so the option to move around and check the readers would have been extremely difficult. In this era of smartphones, a timestamped picture/video of the reader being out of order could make the difference in having to pay a ticket or not. passengers should not be responsible for repeatedly checking to see if the device has cycled back on. That said, the driver straight up lied, and the fare police will always believe the driver, so evidence is your best friend. There’s not enough time to take a picture of the reader. I don’t understand? Why couldn’t you set up your camera and re-tag and snap a photo? If the reader is broken, it’s going to give the message each time it’s tagged. Yeah, inconvenient for the people behind you, but saves you (and potentially them, if an enforcement officer checks) from paying the fine. It’s ridiculous for passengers to take pictures of broken machines or go talk to the driver. Effectually you’re wasting EVERYONE’S time! Walking up to the driver, talking to the driver, having the driver attempt to troubleshoot, and the time of all your fellow passengers that just want to go where they want to go! It’d be cheaper to just let the bus go!!! But come on, next we might as well just request video footage attempting to tag! and showing these things out of service! Except they probably wouldn’t produce the video before it gets deleted!